Summer is in full blast these days! My parents' house in the country is full, overflowing even, with 19 of us (including children!) Yep, 19 for breakfast, 19 for lunch and 19 for dinner.... And because at some point adding an extra plate (or two) does not change anything, we have guests at every meal! That's when you are really happy to be able to eat outside in the garden. And that's when meal & inventory planning becomes critical : hard to plan an easy pasta emergency dinner for 19 when there is only one small bag of pasta left in the cupboard, non? Cooking is one activity of the day, and because there are so many of us to help out, nobody feels that it's a burden... It's also a good time to catch up... Somehow, this week, I have been assigned to les desserts. Individual tartelettes are out, banana nut bread, orange cake or clafoutis are in! Because we already had cherry clafoutis the other day to finish up cherries that someone brought us, I decided to make something different. This turnover cake is delicious, easy to make and feeds at least 8-to-10 persons. Exactement what I need to be able to spend time outside and enjoy the company! Bon appetit! Melt 15 gr of butter in a skillet (that goes into the oven) with sugar until the liquid thickens. Whisk butter and sugar together until fluffy. Add vanilla extract and the eggs, one at a time. 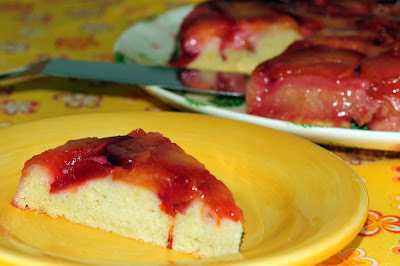 You can make this cake with other fruits : apples, pears, cherries, nectarines, apricots, etc. I would not be able to tell you where and when I ate my ten favorite American food for the first time... but I can tell you that they have had an impact on my multi-cultural eating habits! Here are the 10 American things I miss the most when I go back to France because yes, not matter how strange it can seem, I do miss a few things, food-wise, from the US! Who knows, maybe ten years down the road, I'll have had the opportunity to try something else that would make it to my top 10. What would it be? Poppyseed bagels : toasted with Lox, capers, black pepper, lemon juice and, if available, alfalfa sprouts.... but I don't like them plain! It is also a Top 10 favorite of my children and husband. Fresh sweet Corn on the cob with lots of real butter, salt, and pepper. Clam chowder for the cold and rainy days. A hamburger but I'm not talking Double Arch kind-of-burger. I mean a real grilled juicy one, made to order. Pumpkin Cake (not pie), best ever eaten in Canada (but that's OK, no?) at my husband's cousin's in-laws about 6 years ago. I'm still trying to get the recipe. Carrot Muffins: hard to find but really good in the morning.... still looking for the perfect recipe. Anyone? In my last post on Cannelés (have you tried making them yet?Are you planning on making them this coming week-end? ), I stated that I have a hard time purchasing something that I can make myself for less money and fewer additional ingredients I don't control (what was the Western world eating before their government started subsidizing they discovered soy, tell me ???). A posteriori, there might be one exception to this rule of mine: Dulce de Leche. Dulce de leche, aka Confiture de lait in France, is a thick caramel-like spread that Argentinians (and other people in South America) eat on and in everything. Like Americans with Peanut butter. Dulce de leche is way too sweet for me to enjoy it but because we had Argentinians friends over a few weeks ago, I decided to make Dulce de leche ice cream for dessert. And because I like to make things from scratch, I decided to make my own Dulce de leche. I actually made it twice since I made another batch, using a different recipe, the other day. Don't get me wrong, the result was delicioso and since that comment was made from people who were born swimming in Dulce de leche, I can assume it was a compliment, n'est-ce-pas? So what's up with my exception? Well, you see, making Dulce de leche from scratch has one of the longest time-to-table: 3 to 5 hours on the stove! And although I have become much more patient with cooking time since I started cooking a lot, 3 to 5 hours for milk + sugar to turn into this thick caramel-color spread is not worth it to me. Unless, like here in rural France, I don't have access to Dulce de leche and don't want to change my dessert plans (all started because we had an excess of milk that needed to be used and because of cholesterol-levels among my relatives, I could not use eggs to turn the milk into a custard of some sort.) But I won't make two batches of Dulce de leche this Summer. There are plenty of other desserts worth my time and energy to be made before! I leave it up to you to try it your way!But don't tell me that I did not warn you that it was really time-and-energy consuming. Bon Appétit! Pour the Condensed milk and vanilla into a pot and cook for 3 hours on the stove. The milk should never boil and you have to stir occasionally so that it does not stick to the bottom of the pot. The milk will take a caramel-like color and thicken. Pour milk, sugar and vanilla in a pot. Bring to a boil and then cook on the stove for 3 to 5 hours until the liquid thickens and turns into a caramel-like color. 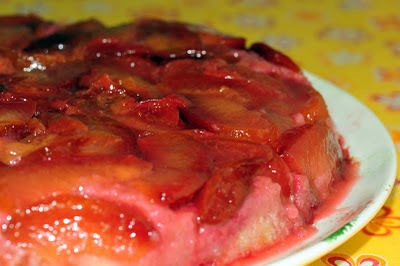 The Recipe 1, even though I did not control the ingredients, gave a thicker Dulce de leche. 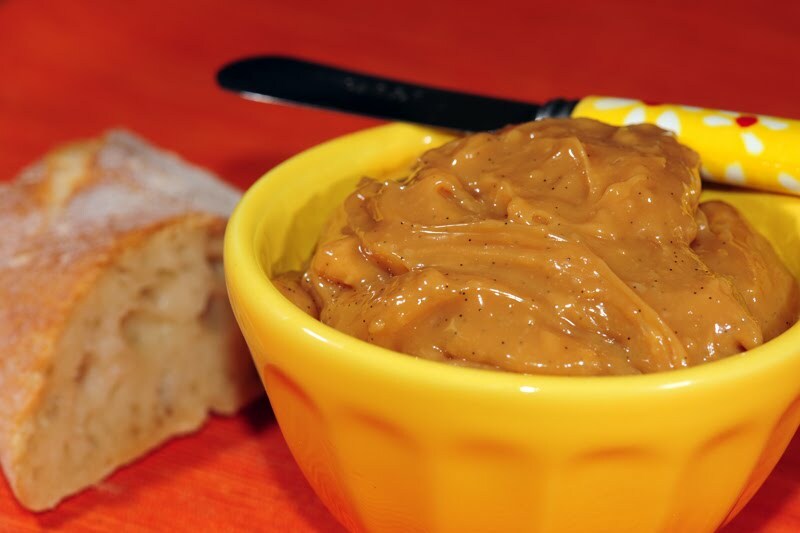 You can spread the Dulce de leche on bread or use it the same way you would use Peanut Butter in baking, making ice cream. Why pay $$$ for something you can make yourself in a healthier version and at a much cheaper price? If you started cooking from scratch on a daily regular basis, you might have wondered the same. While I had always balanced the pros&cons of purchasing this or that based on my desire ability to make it, I have become much stricter since I started this blog. After 10 months of easy homebaking, I have stopped purchasing biscotti, pizzas, granola, guacamole, or hummus. I am still buying tomato pasta sauce because I have yet to come up with my own recipe (I don't like canned tomatoes); we still purchase jams and Nutella (but I am hoping to make my own hazelnut-chocolate paste soon); we still purchase chips and tortillas (could I make them?) and I have a few frozen Chinese dumplings for emergency dinners. Et c'est à peu près tout! The most difficult to get rid of are cookies: because my husband needs some sugar when he comes home from work but I don't want to make dessert/cookies everyday (yes, even for my beloved husband). So oui, de temps en temps, we still purchase a few industrial cookies. And chocolate, because making my own chocolate bars is beyond what I can imagine and I love chocolate with my after-lunch coffee! I figure that it's not that bad considering all the homemade food we eat otherwise! Cannelés, a pastry from the Bordeaux area in France, are an example of pastry I would not purchase. When I first moved to the US, you could not find Cannelés in this country. Nowadays, albeit less ubiquitous than fancy-highly-sugar-coated cupcakes or upcoming macarons, a few bakeries sell them in Philadelphia.But at a price that I would not even consider! I had never made them myself before my brother and his wife lived in Bordeaux for a few years. There, my sister-in-law started making her own and we made some together for our children' baptism two years ago. I think that we both remember it because we had planned to offer two Cannelés to our guests (one would have been trop peu) and, albeit a "small" baptism, we had to make at least 8 batches! And there were not enough! Evidemment! Cannelés are really easy to make. Trust me: a little bit of ingredients stirring, a lot of resting, a lot of baking ; the only drawback is that you need to bake them at least 24h after you started making the batter. And for about one hour in a special mold! So yes, it's not a recipe pour le jour même... but even that would not be enough for me to go and spend $$$ on Cannelés at the pastry shop. I would change my plans for dessert instead! Even if we all love Cannelés in my family! Especially my husband! 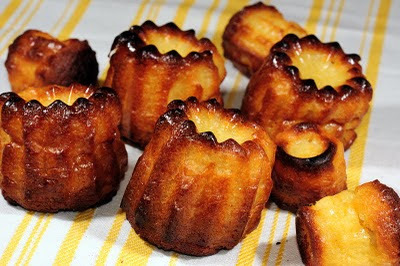 Cannelés are perfect to have with a cup of coffee/tea; they are also great to bring to a picnic! So plan ahead for next week-end! Bon Appétit! In a saucepan, bring milk, vanilla extract and butter to a boil. Pour boiling milk over the flour mix and let cool. 1 hour before cooking the Canneles, bring the batter back to room temperature for one hour. Fill the Canneles molds to 3/4. Cook in the oven for 5 minutes at 270C then bring the temperature down to 180C and cook for one hour. The Canneles should be brown on the outside and soft inside. You might want to have two sets of molds so that you can cook them at the same time instead of spending more than two hours cooking the Cannelés. You can keep the Cannelés for a few days in a box. I have both mini and regular size canneles molds and I like the regular size best. I have the Silicone ones and they are OK with me. I can't see myself buttering (and cleaning) copper molds! Don't worry about the rum in the batter; you can not notice it once the Cannelés are cooked. I love sports. I love to play sports and I love to watch sports on TV. Well, I can't get motivated with the French/English/Spanish soccer national Ligues but I do enjoy Wold/European Cups games or whenever there is an international competition (boxing excepted). When young, one of my dreams was to compete in the Olympics (why not?). I was doing track&field back then and clearly remember Carl Lewis at the 1984 games in L.A. When I quickly realized that my athlete career was not going to happen because of wrong DNA héritage, I thought that organizing the Olympics could me another way to be part of the international sport scene. While still not impossible, I do think that my best chance at the Olympics these days is to go and watch them live! In the meantime, I watch other international competitions and still try to understand the rules of baseball, American football and hockey!! And yes, I try to exercise! The Soccer World Cup is currently taking place in South Africa. I won't comment on the mediocre and scandalous performance of the French team; one of the semi-finals (Netherlands -Uruguay) is taking place today and I'll be watching together with my dad. Growing up eating in front of the TV was interdit in our family unless there were national elections results.... and it's still de rigueur today. Too bad because I have a few good recipes of things to serve! 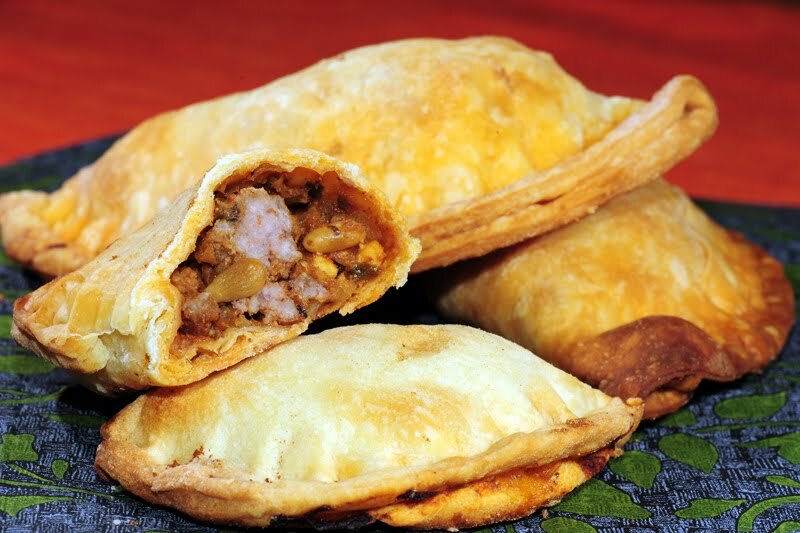 One of them are empanadas, a traditional fast food of Argentina (Colombian empanadas are different). My husband and I were fortunate to travel to Argentina a few times in the past. For lunch, we would always order empanadas and the best we ever ate were at our friend G. in Las Varillas. Now we make them and serve them for dinner, together with a salade verte. They are a great alternative to pizza or quiche Lorraine and always a hit among our children. A perfect dish to serve at a picnic or when there is a good game to watch! Bon Appétit! Pour the flour and 1 ts of salt in a large bowl. Slowly pour the milk and mix with your fingers : the dough should be soft but not sticky. Make a ball with the dough and cover with plastic wrap. Let it rest for one hour in the fridge. Add the meat, salt, Cayenne pepper and raisns. Lower the heat and cook until the meat is fully cooked. Remove from the stove. Then add the tomato sauce, olives, and pine nuts. Finish by adding the egg pieces. Cover with the other half and close, using water to seal the dough. Use a fork to mark the edges. Eat warm with a salad, adding hot pepper sauce if you like, Chimichurri would be best. What I like best about being in Europe is that distances make it possible to travel to visit friends and relatives at affordable cost and time while seing beautiful landscapes. My younger brother currently lives in Strasbourg, a medium-size French city, home of the European Parliament, located on the Eastern part of France, at the border with Germany. The French high-speed train (TGV) takes you there in 2h20 from Paris (as opposed to close to 5 hours by car), which made it a definite stop during our European vacations this Summer. It was also the perfect opportunity to visit my dear friend J. who lives with her family in Offenburg, a small town in Germany that is only 30 mn away from Strasbourg. I had been to Strasbourg a few times before but only as a tourist. Being here at my brother's, discovering their local playground and commerçants makes it even more enjoyable. Alsace, the region where Strasbourg is located, is famous for a few culinary spécialités such as Choucroute, Kouglof, Munster cheese, good beers, and excellent wines like Gewurtzraminer and Riesling. All of which I enjoy, preferably on a Winter day. Let's face it, as my brother was telling me the other day, the culinary répertoire of Alsace is worth le détour unless it's boiling hot outside or/and you are on a diet! Portions served in restaurants are American-like, and even local have a hard time finishing their plate (and no doggy-bag option here). Only my husband would have been crazy willing to eat a choucroute on a hot day like today in Strasbourg. Because he is enjoying his own American-size portions on the other side of the Atlantic, we are cooking a lot of grandes salades composées. It's in the upper 90s today and we don't feel like eating anything "heavy" (but I won't say no to a glass of Riesling!!). I realize that it is quite a challenge to feed children a salade composée when they are used to eating a three-course meal with a serving of fish/meat with vegetables/grains. Of course it depends on what we compose the salade of. The most famous French salade composée is the ubiquitous Salade Niçoise, which I have adapted here for my family. Here, we generally compose with what's available in the fridge/cupboards while trying to balance vegetables and grains and taking into account what everybody already had for lunch to avoid redundancy. Most of the time the end-result is creative (to say the least) but nonetheless delicious. I find out that our children eat the salade composée with limited reluctancy when we agree to let them pick out one thing (or two) they don't like (for real or just because their cousins don't like it). It is also my experience that the thinner the ingredients are cut, the more likely they will be eaten. I don't offer a mush of shredded pepper-carrots-radish pour autant (not appetizing at all!!) but I do cut the bell pepper and onions very very thin! And, just for the fun and the appetizing colors of salades composées, I always try to have 3 or more colors in the salad! It's Summer after all! Bon Appétit! 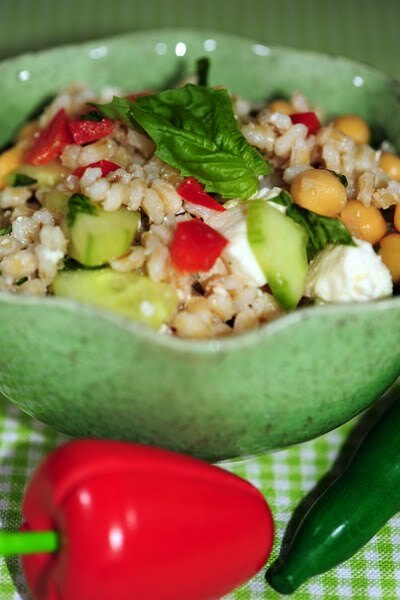 Mix in chickpeas, cucumber and bell pepper into barley.